Lilium longiflorum, November Lily, Christmas or Easter Lily is native to Japan and Taiwan. 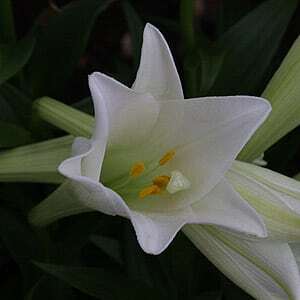 One of the most widely grown lilies, its fragrant flowers are used in floral arrangements as well as for cut flowers. Flowering in mid summer the Easter lilies actually seen at easter are forced in the Northern Hemisphere and held back in the Southern Hemisphere. Lilium longiflorum with its large white trumpet shaped flowers can be grown in pots or in the ground in a humus rich well drained position. Lilium longifolium are an easy to grow fragrant white trumpet lily that prefer a humus rich moist well drained soil and a sunny position with protection from afternoon sun. Humus rich moist but well drained soil. A position where the plant can get good sun without having to ‘reach for it’. Keep the area around the bulbs free of weeds and lightly mulched. Good drainage over winter is essential to prevent bulb rot. Each spring, top dress with a little aged cow manure and compost..
You can fertiliser with a liquid fertiliser in spring as the new shoots appear in poorer soils. The easiest method of propagation is by division of established clumps. Over time these bulbs will form a clump and will benefit from division every 4 – 5 years. Wait until the foliage has died right back, usually in autumn. This is the time to dig, divide and replant the bulbs. You will find the bulbs multiply faster, and you will get more flowering sized bulbs if you do this.